Many thanks to Carolyn Charles, retired Park High teacher and official historian of St. Louis Park Schools, for much of the following information and pictures. This page is mainly about the building; for other information, see the Schools Timeline. St. Louis Park Senior High School was built in 1956 at a cost of $3.5 million. 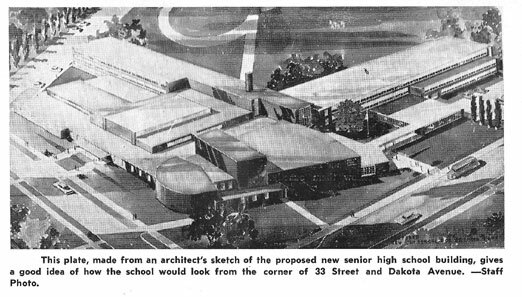 The first mention of a new High School is in the September 8, 1953 Echo, which reports that preliminary plans are being drawn up. The 17-acre tract at 33rd Street and Dakota had been owned by the school district for some time. The land has previously been used as a skating rink, although some houses had to be removed. The 1930 Census lists Earl Sewall at 3300 Dakota. The hope was that it would be ready for the 1955-56 school year but it took another year. On November 23, 1953, the Village overwhelmingly voted its acceptance of a $4.2 million school bond issue to build the new Senior High and what would become Ethel Baston elementary school. The new High School would “be adequate” for 2,000 students. Below is the artist’s sketch of the building as published in the November 5, 1953 issue of the Echo. Preliminary ideas were accepted by the school board on March 1, 1954. The Echo reported that the building was to include 30 classrooms, special rooms for sciences, commercial subjects, speech, dramatics, band, and chorus. The auditorium would seat 1,000. There would be a suite of rooms for teaching home management. Rooms were allocated for the Echo, Echowan, and student council. The gym would have folding bleachers that could seat 2,400 fans, and a folding door that would divide it into two areas, one each for boys and girls. A swimming pool would be located near the gym. Northwestern National Bank and First National Bank bought bonds for the new High School for $1.25 million at 2.81 percent. The new building would be the largest in Minnesota since World War II. Construction started in February 1955. The new school opened in the Fall of 1956. The Echo was relatively low key about it, but did mention its “tipless desks”, curtains that replaced old-fashioned window shades, and the radiant-heated floor in the 33rd Street lobby. The population of Park High just grew and grew. Teacher Jack Alwin recalls that when the staff first moved to the new building from Central they called it “extra-curricular high” because there were so few classrooms. There was discussion about building a second high school, as other suburbs had done. Superintendent Harold Enesdtvedt prided himself and the school board for their decision to expand the current building. In May 1960 the School Board commissioned Bissell & Blair to build the addition, predicated on a peak enrollment of 2,500 in 1966. Construction of the so-called “McDonald’s wing” on the south side started in October 1966, at a cost of $10 million. The two-story addition was used for vocational training such as advertising, secretarial skills, machine shop, printing, drafting, nursing, etc. Also new was an expanded art room, an orchestra room, a distributive education area, a special computer math room, and a resource room set aside for the school’s blind students. The track was improved: there were 8 42 inch lanes on the 440-yard track and 4 lanes on the 330 yard track. Enrollment was 2,468 students. The addition was the result of a conscious decision not to build an additional high school as other suburbs had done, and Superintendent Enestvedt considered that decision the most significant part of his legacy. 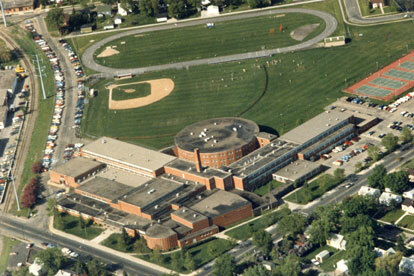 In 1993, major remodeling was done to the Media/Technology Center (library) and the second floor circle. Design flaws had the outside wall pulling away from the floors, leaving gaps at the outside edge of some of the third floor classrooms. A new, accessible front entrance was built as well. The school has many photos of the 1993 remodeling. In 2001, the third floor of the 33rd Street side was remodeled to provide updated science classroom. Also, additional gym space was added along the railroad tracks. See the school’s web site at http://www.slpschools.org/sh/.